Austin Housing Coalition has partnered with HousingWorks Austin, Austin Women in Housing, and Austin Housing Repair Coalition to host candidate forums for the Mayor and City Council elections that will be held in November. 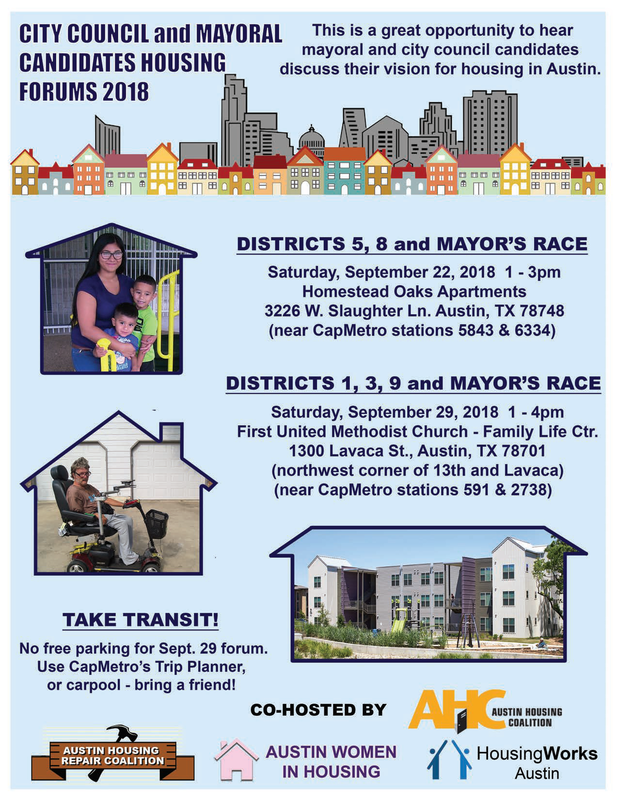 Click to enlarge the schedule of 2018 City Council and Mayoral Candidates Housing Forums. Along with the forums, a questionnaire was provided to every candidate. You can review the responses by clicking on the candidate’s name. All District 1 candidate responses can be found here. All District 3 candidate responses can be found here. All District 9 candidate responses can be found here.